Patates Lemonates sto fourno (Baked Lemony Potatoes), which is a classic Greek side dish of roasted potatoes, is usually made with olive oil, salt, pepper, lemon juice and water. What makes mine special, is that apart from the classic ingredients, I also add other spices as well and some juice from oranges, preferable from bitter oranges (also known as Seville oranges), which is very aromatic and adds amazing flavour to the potatoes. When we add meat to them such as chicken, pork or lamb we just call it “Psito sto fourno” (baked in the oven). The pan drippings can be used as they are or you can make an even more delicious sauce, as I did. See my recipe for Roasted Wild Boar. I love making them with the skin on but one of my children doesn’t eat them with the skin, so some times I have to peel them. However, all the vitamins and flavour are in the skin, so if you don’t mind the skin, leave it on. You can skip the aluminium tent on top. In this case, I usually parboil them for around ten minutes and then cook them uncovered, turning them once, until golden. This is all it takes to make these delicious potatoes and serve them as a side dish. Although it’s over a year that I have made this twist to the Greek classic dish I still remember how finger-licking delicious they were, as the potatoes absorb all the juices and flavour. During the fasting period of Lent, they can be eaten as a main dish with a lovely salad. 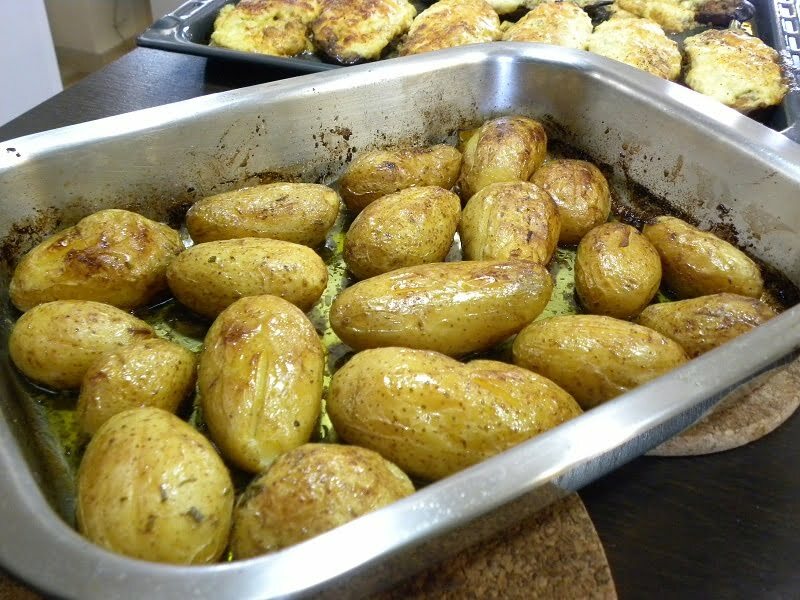 Make a slit in each potato and put them in a roasting pan, in one layer. Sprinkle with salt, pepper, chopped rosemary, oregano and thyme and toss them well. Put the olive oil, lemon juice, orange juice and garlic in a food processor and purée. Cover the baking dish with parchment paper and aluminium foil (rad above) and bake until the potatoes are soft for about 1 hour. Remove the foil, and bake them for 20 – 30 more minutes, turning them once until they are golden and soft. Remove the foil, and bake them for 20 - 30 more minutes, turning them once until they are golden and soft. Many times, instead of making this side dish or instead of making fried potatoes, I cook them wrapped in parchment paper, which are more healthy, delicious and with less calories. They are a nice side dish to baked fish, pork chops or mpifteki, which is a meat patty similar to a burger. Wash and peel the potatoes and carrots and cut them as above. Lay a large piece of aluminum foil and top with a grease proof paper. Put the vegetables as well as the remaining ingredients and mix. Wrap the grease-proof paper and wrap them around in aluminum foil to prevent steam from escaping and bake in preheated oven to 180 degrees for about 1 hour. Unfold the aluminum and grease-proof paper and let them cook until golden. Be careful not to spill the juices. I want to thank all of you who have already placed the picture of my cookbook with a link to my page, on your blog. For those who may have missed my previous post at the end of the month I will be making a draw of another copy of my cookbook. All you have to do is right click on the image of the book below and “save as” on your computer. Then upload it to your side bar with a link to my blog and leave me a message at this post with your URL. Psito is what we used to eat on Sundays. Delicious recipe Ivy. Yumm, those lemony potatoes looks absolutely fabulous.. They look fantastic! That is one of my favorite ways of baking potatoes. Super special potatoes. I love patates lemonates and is a staple in our family. I love potatoes and lemon so I will definitely be trying this recipe, sounds and looks wonderful! Lemony potatoes sound really great! Is Greek oregano different from the oregano used in the pizza? Angie, even in Greece there is a distinction of flavour depending on the area and since I have not tried oregano in other parts of the world I cannot say if it is the same or not. I have tried store bought oregano here in Greece and it does not compare to the real stuff we get directly from the mountains and dry. Such yummy potatoes, I love the flavors with citrus, excellent! I always love roasted potatoes, and the sauce with citrus and herbs sounds fantastic with them! J'adore les pommes de terre. Alors, ta recette me plait beaucoup. mmm… one of the first Greek foods I ever loved, long before I visited Greece! Lemony potatoes? Sounds good. The acid in the lemon and sweetness of the orange must be complementing the potatoes really well. I can just the lovely flavors here. Would pair so well with a grilled meat dish. That dressing sounds amazing, Ivy! What a great alternative to the standard (but amazing!) patates fournou. Lovely patates fournou Ivy! They look spectacular. I could easily eat the potatoes and not the meat! I bake potatoes only rarely, though I know that they go well with, for example, roasted meat. I like the ingredients in the dressing of your recipe, and I am curious about the flavor the juices impart to the potatoes. Oooh! Mourlia! Patates sto fourno are the best…I just think you made them better with this dressing! Now all we need is some katsikaki! Lemon potatoes sound like a wonderful treat – I cooked lemon potatoes once out of Jamie Oliver's Cook, but I can't remember if it was similar or not. Visiting from Rosa's and so happy I stopped by. What a delicious recipe that I will have to try! Thank you. I have been roasting potatoes more and more often as winter advances but I absolutely must bake them this way next! Wow the flavors (more than just lemon!) are fabulous! This flavorful side dish would really be perfect with plain grilled meat. Delicious! I wanted to say that I got your book and I find it fantastic! I am getting reading to post a review on it today or tomorrow. Thanks again Joumana. Imagine I only saw the comment after I saw your post on Facebook and after visiting your blog. I have included you in the draw as well. Ivy these potatoes are my favorite. Lemonates patates are simply the best. I like the twist you made to them! I do not eat meat, but these potatoes are great all by themselves! These lemon potatoes sound so good! these potatoes are so flavored! Ευχαριστώ, μια χαρά είμαι. Θα σε επισκευτώ σύντομα.